The Comms Crowd – On K.I.S.S.ING – Keeping it simple, stupid! On K.I.S.S.ING – Keeping it simple, stupid! Fellow freelance PR Lianne Robinson makes it brief. I saw this tweet from Tom Knowles a few weeks ago, And it stayed with me. I see this type of thing all the time. 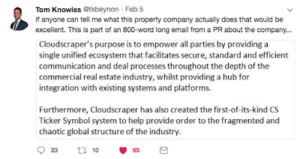 Paragraphs beyond paragraphs of long clunky words with no clear explanation as to what it is they are trying to say.You can spend what seems like an age watching a company description going around the various the heads and powers that be of a company. I know this as I’ve worked in-house too. Everyone wants to add their own point of view, something that makes them feel that they played a part in the creation of the copy. But in doing so, adding a long word here and a bit of jargon there, we can completely lose all sense of what we’re trying to say. When you work for a company you can get so immersed in it and the technicalities around how it works that to come up with a simple sentence to describe what it does exactly can be the hardest thing. We see this a lot in PR too. When I ask a company for 800-1000 word article on a chosen subject its easy. When I ask for a two-sentence reactive comment, it seems to take all day. And it’s the same for me too. For some reason writing less always takes more. Let’s take the example above with Tom Knowles. Tom is the property reporter at The Times so we can assume that this is a property company (if the PR has got the pitch right!) but what they actually do is anyone’s guess. Tom’s a busy man. He needs to sift through hundreds if not thousands of emails every day looking for the best news stories all while writing insightful copy for tomorrow’s paper under tight deadlines. He doesn’t have time to read 800 word emails. Tom needs to understand clearly from the outset why this company is great and unique and why it is that he should be speaking to them. Think about how you read a news article or blog. If you read the first 100 words and you’re either a) not interested or b) you can’t see where it is going, then you are going to switch off and move on to something else. It’s the same with PR pitches. You’ve got to be succinct right from the start and make it very clear why your client is so interesting. I’ve often questioned if my pitches to journalists can at times be too simplistic. I go back through them trying to add in fancy adjectives and make things sound perhaps more revolutionary than they actually are. What my clients are paying me to do is make sure that the journalist understands why they are so great and why I think it will make a good story. Translating this 800 word description in to two or three easily digestible sentences that get the journalist interested and want to find out more. So next time you’re thinking about your ‘story’ find the three things that you think make it unique and interesting and express these points high up in your pitch. If you can capture the journalist’s attention in the first two sentences, then that’s half the battle won. If you’re not entirely sure what these key messages are, then it’s time to go back to the drawing board and start the process again. Keep it brief. If the journalist is interested in the story that you are pitching then they will come back to you with questions. Keep it clear, to the point and highlight why it’s interesting in a couple of short sentences. Keep it simple.